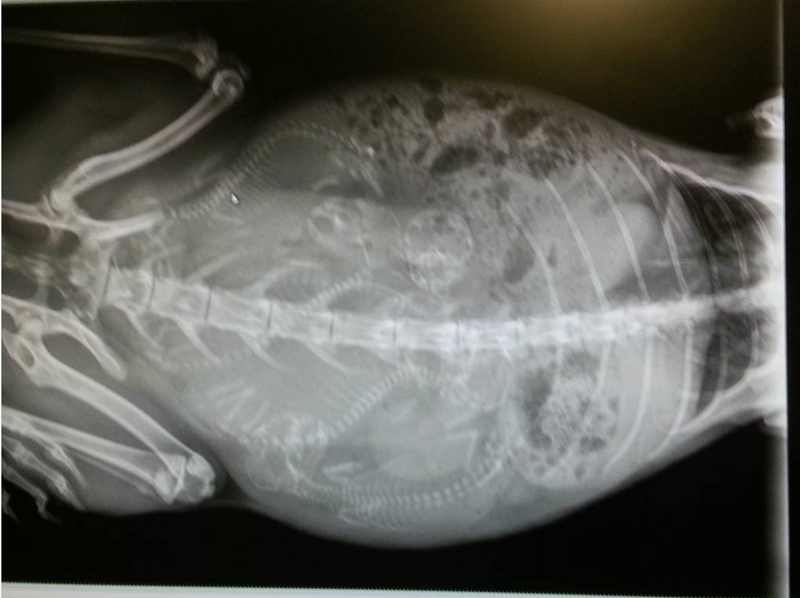 If you look carefully you can see 5 little spines and skulls in there. 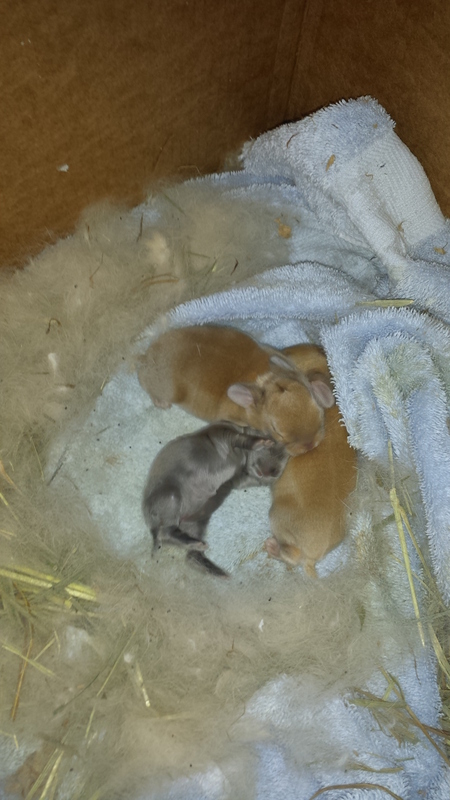 Later that night, she popped and our collection of rabbits grew. Unfortunately the little black one was lagging behind. We don’t know why, but after a 12 days he was half the size of his siblings. We started trying to feed him and keep him inside on a warming pad. It was not to be. He died before two weeks hit. On the bright side the other two appear very happy and healthy. 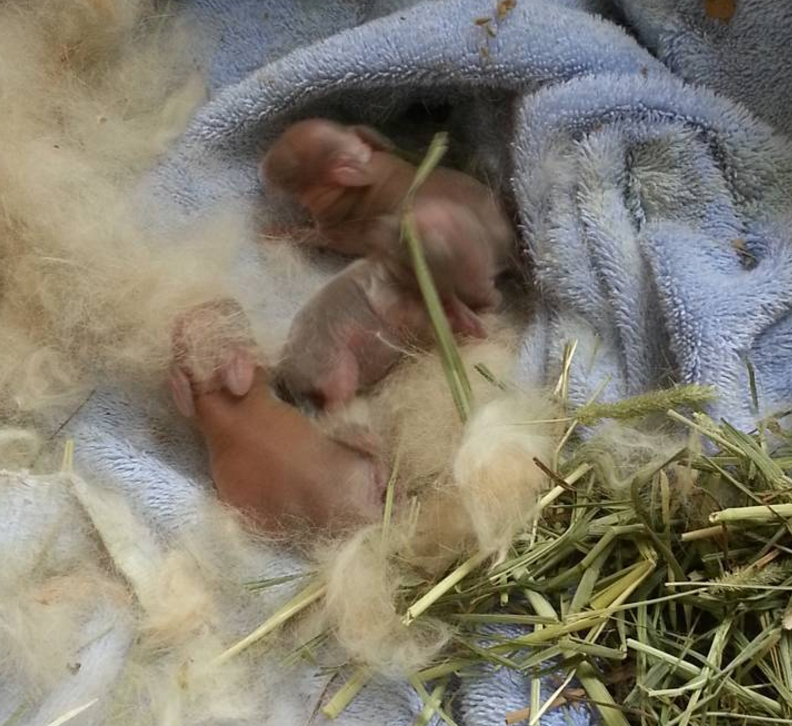 At about 16 days they started opening their eyes and exploring a bit. They are fuzzy, playful, curious and very jumpy! We dubbed them Luke and Leia in honor of them being twins and the new star wars movie. Check out this video of them being cute as can be. Papa Tyrion got his snipping moved up and is not going to be making any more bunnies in this lifetime. 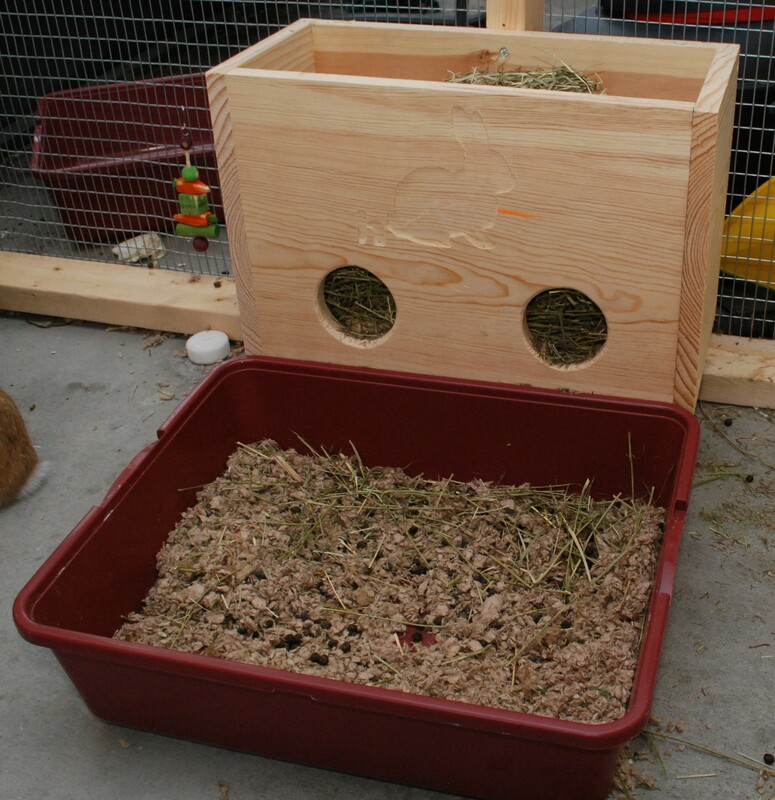 I didn’t bother with a lid for my hay feeder because I figured the bunnies couldn’t get inside, and there was no other reason to cover it. Well, as it turns out, they can get in. That is a baaaaaad bunny. I don’t know why sitting in the litter box and nomming the hay from the hole wasn’t good enough. Maybe sitting in your food while eating offers some special pleasure. 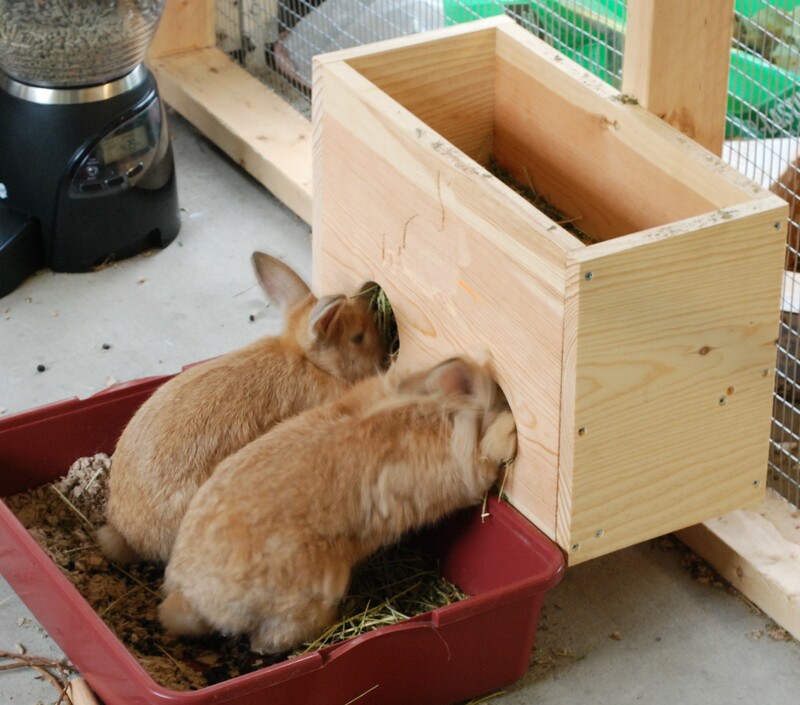 I made a quick feeder for the new buns in kind of a rush and without a lot of research. 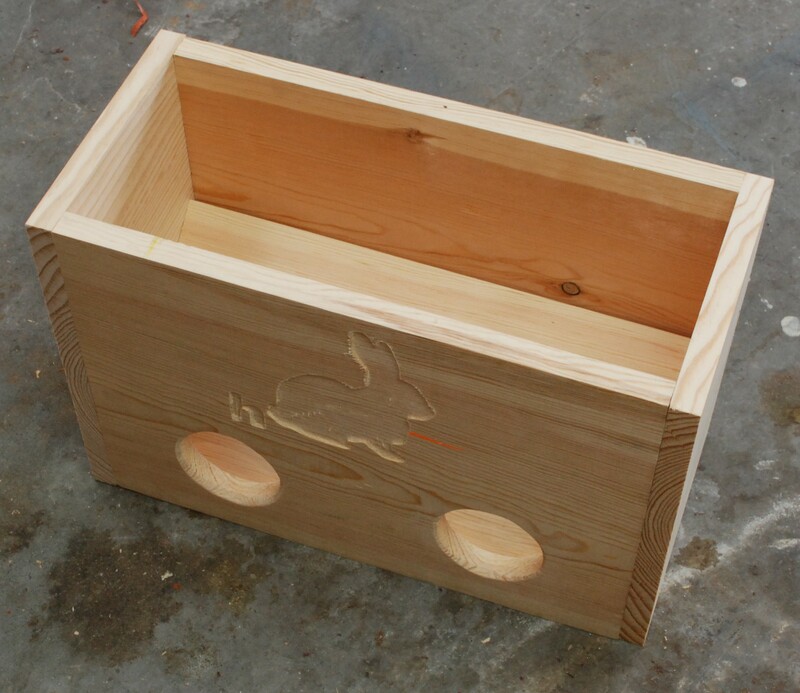 It was a shallow 3 sided box with vertical dowels to hold the hay in across the front. The dowel spacing was bad. First it was hard to get their heads in because it was too narrow, then when I removed a few dowels it was too wide. They tended to pull a ton of the hay out into their box. 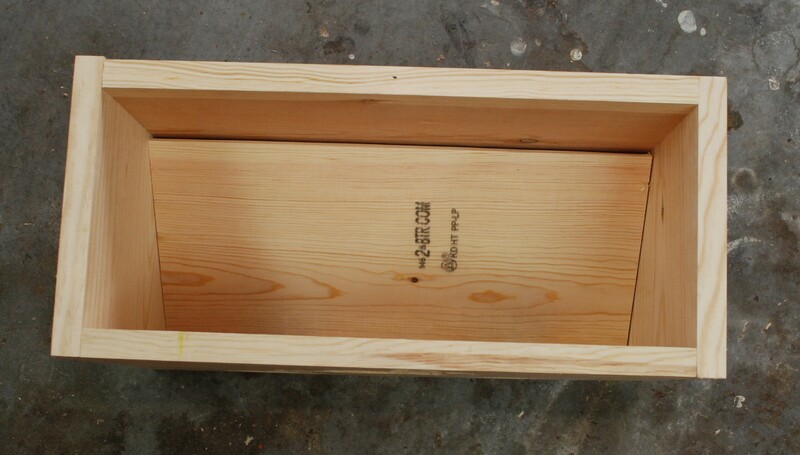 A solid box with two holes is the right way to go. I used some 1×12 pine to give a nice tall body. 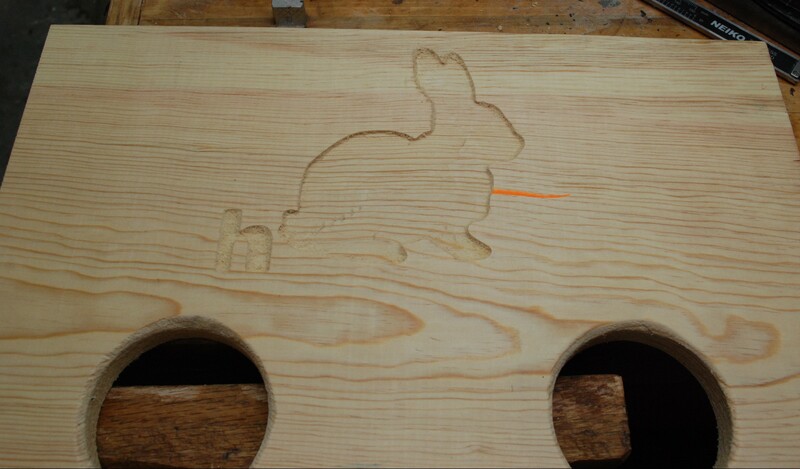 I wanted to engrave a bunny silhouette and the words “Chow Time” on the front. Unfortunately I didn’t center the piece well and my CNC hit a hard limit. It got to the “h” and I knew the rest would be ruined. So skip the words and make the bunny bigger instead. Had it gone well I would have taken the time to do some color inlay. oh well, next hay box. I assembled the front with sides and a back to make a box with no top or bottom. Instead of a flat bottom I used a plane to put a rough angle on the two edges of a board. Once installed at an angle it made the bottom ramp towards the two feed holes. This picture shows the ramped bottom better. 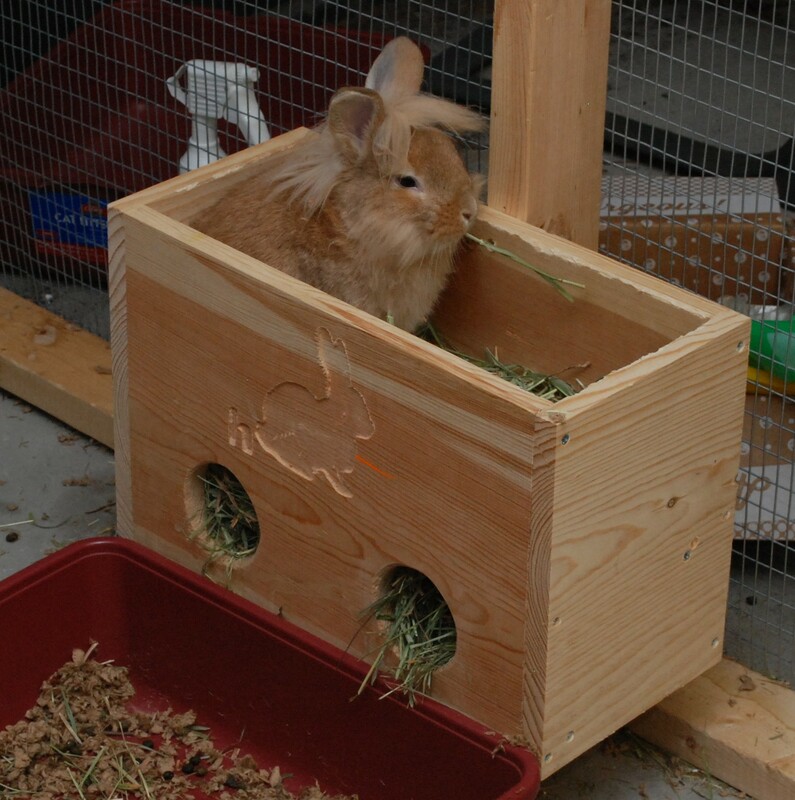 I installed it to the bunny fence set at a good height for their litter box. There was going to be a lid, but I decided against it. No reason really, just dump hay in when needed! UPDATE: As it turns out, they can get inside. A lid might not be a bad idea. 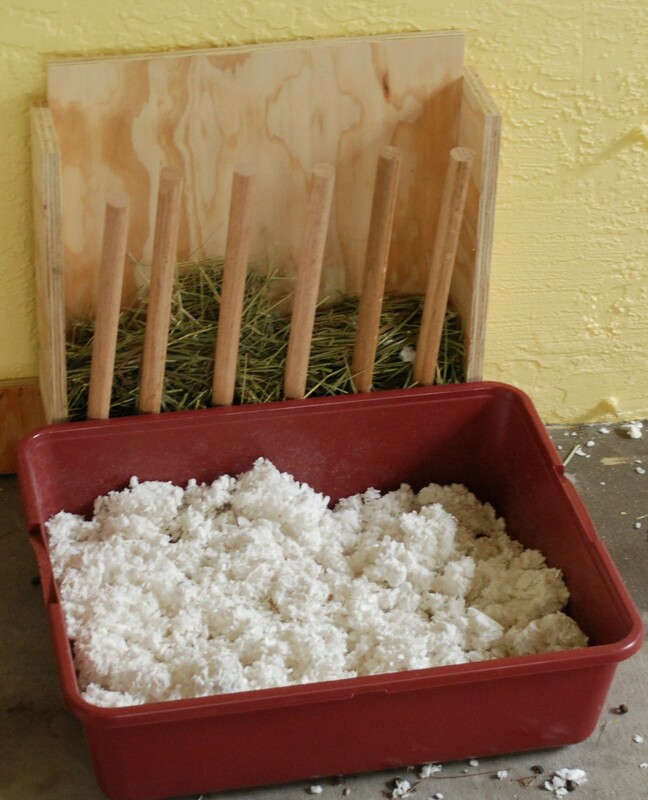 This box has a ton of capacity, and because of the smaller openings than my previous attempt they tend to pull a lot less into their litter box. This means less filling and less waste. They can often be found with their little faces stuffed in nomming on bits of hay.